EP-H130H Hydraulic Compression Tools: Izumi Products. The EP-H130H is a H-head with a one inch jaw opening. It accepts all shell type dies and dies for deep indent crimps currently used in 12 ton tools on todays market. 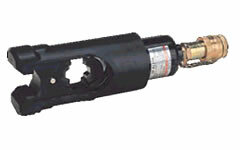 A 700 bar (1000 PSI) external pump is required to operate this tool. Consult your conector manufacturer for exact cable, connector and die combinations. Accepts all dies used for Alcoa, Burndy, T & B, Klauke, Cembre and blackburn 21 ton compressors, as well as dies for deep indent crimps.